Available May 1st. 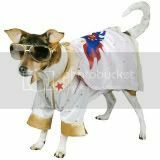 60% of proceeds to benefit Charlie's Helping Paw Fund! 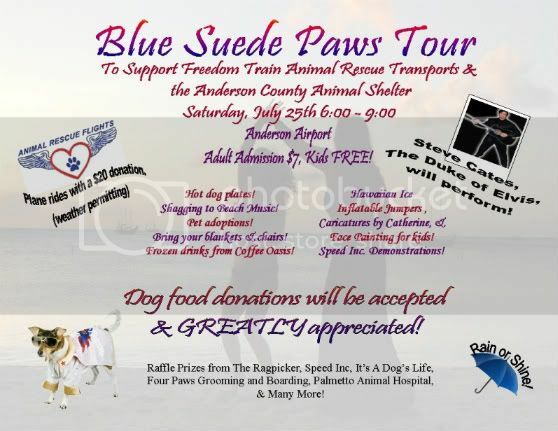 Freedom Train Animal Rescue Transports presents the "BLUE SUEDE PAWS TOUR!!" Come join us at Anderson County Regional Airport, Anderson SC, on July 25th from 6-9 pm for a wonderful evening of food, fun, and entertainment to benefit the Anderson County Animal Shelter and the Freedom Train!! With special guests, the Duke of Elvis, Steve Cates www.dukeofelvis.com and pilots from Animal Rescue Flights www.animalrescueflights.org !! We would love to have you come out and join us in raising awareness and funds for these most deserving animals! Contact me for more info!! PLEASE SPONSOR ME IN THE 2009 DOGS DESERVE BETTER CHAINOFF! This year's Chainoff will be held in Cleveland Park, in Greenville, SC, July 11-12. I will be joining others in chaining for 24 hours, from 11 am Saturday until 11 am Sunday! Please help us spread the word that chaining IS NOT ok! Also, please sponsor me by clicking the link above. NO DONATION IS TOO SMALL!! EVERY PENNY COUNTS!! Dogs Deserve Better is a 501c3 non-profit organization and donations are tax deductible. Thank you in advance for your support! 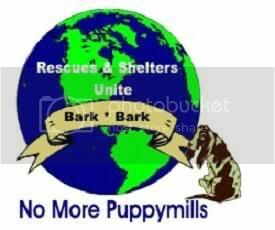 I am so excited about this year's Bark Heard Around the World! The Freedom Train will have a booth set up at the event, and I hope to get to see some of you there! Please make plans to go and let's be a voice for these Prisoners of GREED!!! Show your support for Animal Rescue Transports with a Freedom Train t-shirt! This is just our first style - more styles will be coming soon. 4/20/08 - The Freedom Train Cafepress Store is Open! WE HAVE A WEBSTORE! Hey everybody, check out our new Cafepress store. You can order tshirts and other merchandise with our header picture from the website. More designs will be coming in the next few days. Click the link above to check it out. Comedian Stacey Prussman has taken an interest in Freedom Train Transports™ and even shot a documentary for her show, The Stacy Prussman Show. See clips by clicking her name above - or copy and paste www.thestaceyprussmanshow.com into your browser's address window.